As the name suggests, SkyArbor Guest House is where the trees reach for sky and the mountains meet the plains. This edge region along the west slope of the Crazy Mountains supports abundant wildlife, and many trees and wildflowers adorn the cabin area. A constant delight is the breathtaking panorama, with the Crazy Mountains rising up to the east, and the Bridger Mountains sweeping to the west. Sunrise and sunset can be spectacular, casting shadows across the foothills and rosy hues upon the mountains. The Big Belt Mountains are to the north, and looking south from the top of the property are the Beartooth, Absaroka, and Gallatin Mountains. Living quarters include a large dining/kitchen/gathering area; a study/living area; main floor bedroom and main floor bathroom with shower; a separate sunroom/living area; one large bedroom loft with multiple bed capacity; and one smaller bedroom loft with double bed. Vistas of weather and horizon steadily change. Deer often feed through, antelope and often elk can be seen at a distance (bring binoculars), sometimes moose, bear and coyote wander through, and birds, squirrels, rabbits, and chipmunks are always scurrying by. Horseshoes can be played behind the cabin. A campfire area is available for evening enjoyment. Have a picnic at the outside table, or enjoy quiet time or a picnic at the gazebo overlook. Fishing can be had in alpine lakes or in the nearby Shields and Yellowstone Rivers. Big game and bird hunting are available in national forest lands or block management areas. Yellowstone Park is less than two hours. Shopping, restaurants and galleries can be found in Wilsall, Clyde Park, Livingston, Bozeman, and Big Timber. SkyArbor Guest Cabin started out as a retreat and recreational cabin in 1984, and additions to the building and property steadily advanced. Family and friends savor the dramatic views of weather, sky and terrain, as well as the nearby availability of hiking, fishing, hunting, and sightseeing. 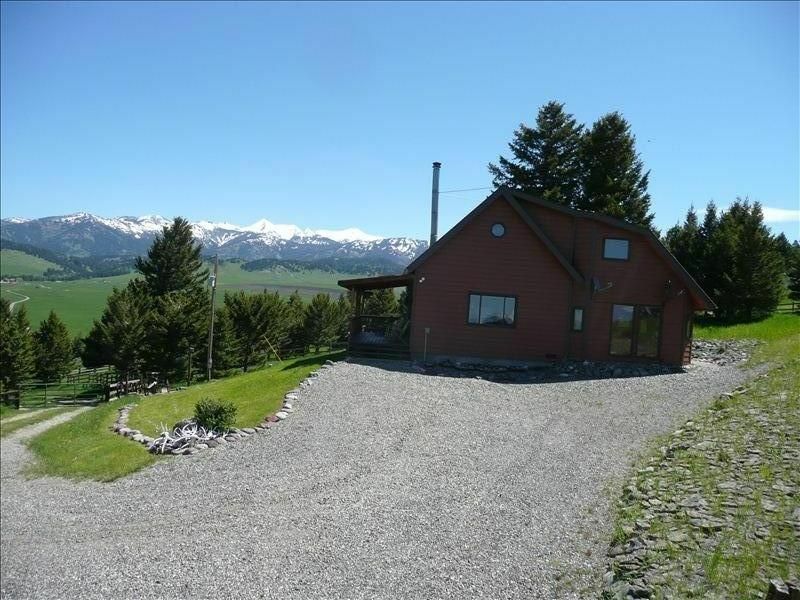 In 2003, the Seastrands made room in the calendar to use SkyArbor as a Guest Cabin, and this is advertised through their website--SkyArbor, Vacation Rental by Owner--VRBO, and Visit Montana-. Guests often return, and Paul and Susan keep the door open for those who seek comfortable lodging amid serenity and panoramic beauty. Most staples and condiments are provided. Gazebo at the top of the property overlooks 7 mountain ranges. Every aspect of our stay was perfection. Instructions given before arrival,and then met by one of the owners who took the time to walk us through property. With the information we received from Susan and Paul we were able to spend our time enjoying family, with the comfort of very organized, clean, cabin . This property is surrounded by amazing views , wild life and quiet . Brenda and family were a delight to have as guests at SkyArbor. They arrived promptly and followed all directions given before and at arrival. Since I don't charge a cleaning fee, I ask guests to leave the home neat. Brenda left the house in great condition. She removed all bedding and towels placing them in one location. Brenda and family enjoyed our resident animals, Jack and Mae (horse and donkey), who will always welcome guests and beg for attention. I would welcome Brenda back at any time. We loved staying at your cabin!!! We wanted peace and quiet and we got it. Spent a lot of time out on the front porch watching nature at it’s best! The hummingbirds were great to watch, along with our usual morning guest of rabbits, deer and pronghorns. Plus we can’t forget Mae and Jack the donkey and horse. I felt like I was in heaven all week! The views of the mountains and valleys were beautiful. 2 mornings we heard the calls of the coyotes, got goose bumps, to actually hear that in real life was a experience! The cabin was very comfortable and had everything we needed. If you are looking for a place to get away from it all this is it! Paul and Susan the owners greeted us at the gate and showed us around and explained everything to us. Thank you Paul and Susan for letting us share a piece of your world in the mountains of Montana, we will be back!! Jack and Kim are an extraordinary couple who came to SkyArbor to find solitude and reflection amid some of Montana's best panoramas. We are so happy for their satisfying experience. While we can take credit for perching our cabin and overlooks on high vistas, the credit for scenery and wildlife goes to Mother Nature. We appreciate the care Jack and Kim gave to SkyArbor, and we as well as our furry and feathered friends welcome them back anytime. When we pulled up to the cabin, we could not believe our eyes! The cabin was picture perfect and the property is set up on a hill surrounded by the most amazing views. Paul and Susan met us at the cabin to go through information with us. When they left, they assured us they were a phone call or email away if we needed anything. We enjoyed our stay so much. The cabin was spotless and equipped with all the essentials and everything we needed. It was so cozy inside and you could take your pick of several seating areas and 3 bedrooms. There were gorgeous views from every window. The property had a fire pit and 2 overlooks to enjoy. There is also a resident horse and donkey! We started every morning with a cup of coffee and every evening watching the sun set from the rocking chairs on the expansive porch. The cabin is close to the quaint town of Livingston and several hot springs. We took day trips to Yellowstone, Bozeman, Virginia City and Nevada City. Some days we stayed around the cabin to relax and walked the back roads enjoying the mountains and beautiful farm land. This cabin was a dream and it was so hard to tear ourselves away from the views. We will definitely visit again!! I grew up in Wilsall and come back every year for hunting and usually stay with family and friends. This year I brought my Son and Son-in-law so needed to find a place to stay. I’m so glad we selected this cabin. Paul and Susan were great hosts and supplied us with everything we needed to know about the property. The cabin was very comfortable and had everything we needed to make our stay enjoyable. We looked forward to coming back and relaxing in the evenings after some long hunts. The views from the property are spectacular. Our only regret was not having more time to spend at the property. We plan on coming back for a summer trip with the wives. We know they will love it. Awesome serenity and beauty as far as the eye can see!! When Pat and Chris stepped out of their car after arriving at SkyArbor Guest House, and exclaimed, "Wow, what a magnificent view!" I knew they would enjoy their days to come. They were very interested in the area and its many natural and civic attractions, and they were attentive to all the features to enjoy at SkyArbor--like the campfire, hilltop gazebo, wildlife and walking areas. While eager to share their love of Florida, they were also eager to dive into Montana. We so appreciated their geniality, their appreciation of the cabin's comforts, and their thoughtfulness in leaving the cabin clean and tidy. Pat and Chris were great guests, and we have every confidence that they would be equally appreciated in other rentals. When my wife and I arrived, we were met by the owners. We were given a tour of the house and property to familiarize ourselves with the area. The Seastrands answered any questions we had and gave us contact information if we needed anything. They want you to have the best time possible while staying here. They are gracious hosts and stock the house with everything one might need to settle in comfortably. There are numerous grocery stores in Livingston to choose from. The house is beautiful and the views are unbelievable plus the wildlife loves to pose for pictures. Mae and Jack are a riot when they come over for "snack time". We had an unbelievable vacation here and will definitely be returning. Kevin and Stacy were a delight to have as guests of SkyArbor. They met us with friendliness and attentiveness as we explained the features of the cabin and property and the activities offered in the area. They left a gracious note upon departure as well as a cabin that was thoroughly clean and inviting. They are just the kind of guests that we appreciate and welcome back. Cancellation Policy: Deposits are refunded, less processing fee of $25, only if cabin is rebooked.